Free shipping for this Power Builder exercise equipment to the lower 48 United States. Tubing clips onto D-rings for secure fit. 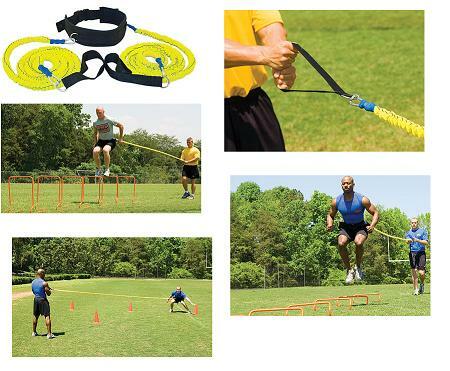 Each unit includes two Slastix resistance tubing fitness harnesses and cords (maximum stretch 24) and a standard belt. Resistance tubing for speed drills fits up to 40" waist. Use Power And Resistance Products indoors or outdoors. Wt. 4 lbs. Belt will fit a 20" - 40" waist. Incorporate Resistance Training Belts into Plyometric, agility and lateral drills. Unique design with loop attachment allows for movement in any direction smoothly and without adjustments. Both resisted and assisted drills can be performed using the Power Builder?. Resisted drills are drills in which the latex tubing is working against, or resisting, the athlete. Resisted drills are ideal for developing muscular strength and power as they recruit more motor units to fire simultaneously. Assisted drills are drills in which the latex tubing is working with, or pulling the athlete along. The key with assisted drills is to be as quick as possible off the ground with each foot contact. This will cause a neuromuscular reaction that will teach the muscles to fire quicker. Resistance Running assisted drills are ideal for developing speed and quickness. The Power Builder & Slastix tubing can help condition you for most sports. Starts from a stance or block. Awesome apparatus. Fast Shipper. Will purchase from again. Q: What is the warranty of this item? A: This is a 90 day warranty through the manufacturer. Fast Shipping: Orders for the Power Systems 10226 generally leave the warehouse within 1-2 business days.